In January 1992, I had the honor of hearing Elie Wiesel speak at my undergraduate commencement ceremony at Hunter College. It was thrilling to hear him speak and I know most of what he said got lost in the moment of seeing Wiesel 20 feet away, but one thing he said rang so true it stuck with me all these years: ignorance is a form of fascism and it must be countered at every turn. I think he later changed it to “indifference” especially in a speech in front of then President Bill Clinton. In front of Clinton, Wiesel spoke of indifference as a state—“a strange and unnatural state in which the lines blur between light and darkness, dusk and dawn, crime and punishment, cruelty and compassion, good and evil… Yet, for the person who is indifferent, his or her neighbor are of no consequence. And, therefore, their lives are meaningless. Their hidden or even visible anguish is of no interest. Indifference reduces the other to an abstraction.” (Wiesel “The Perrils of Indifference” 4/12/99) To me if indifference is a state, ignorance is a willful act; consideration of people as of no consequence and meaningless is now a conscious act. When you look at the tenets of fascism itself, the verb “disdain” appears often which means there is a conscious decision about intellectuals or human rights. Because of this, and after holding back for the last week, I cannot stay silent anymore about the Trump Presidential campaign, the GOP non-reaction to it, and the pitch of rage taking over our country. We see and know how Trump acts on the campaign trail: he’s a malignant narcissist bragging he can “make America great again” if elected. He started his campaign saying the Mexican immigrants are rapists and killers, and has now called for a database of all Muslims in America. He demeans all of his opponents and anyone who criticizes him publicly. He’s seems to be going through the 14 characteristics of fascism pretty quickly and for him there seems to be little going back—at least no apologies for his statements or actions, another way to maintain strength and power. And even with all of that, he’s only down 14 points but still leading the pack, and that is the scariest part of all of this. It seems no matter what Trump says, his supporters eat it up and he stays on top of the GOP polls. His fans and base keep coming back for more and worse. In Boston, two Trump supporters assaulted a man they thought was a Mexican immigrant. Earlier in the summer when Univision journalist Jorge Ramos tried to confront Trump on his immigration stance—force all 11 milliion Latino immigrants out and build a wall bodering Mexico—he was thrown out of the room by Trump’s bodyguards who told him to “get out of my country.” And last week, a Black Lives Matters protestor was beaten up at a Trump rally before being removed. In each instance, Trump stood up for his supporters/assailants and later further escallated his rhetoric about making America great. This is what can no longer be tolerated. What made America great is that we are a place where we can have civil discourse that doesn’t lead to violence. We have serious issues with supremacy and racism/sexism/etc., but not every political discussion must lead to demonizing others and violently disagreeing. Now it is more commonplace and worse it is spurred on ,or at least sanctioned, by those who are vying for the top leader position in the country. Some conservative critics have finally started to call Trump’s actions fascist and only presidential candidate John Kasich has been hounding his actions and positions as eventually leading to fascism. One would hope that can solve things but I doubt it. Over he last 8 years, the GOP has made it acceptable to openly spurn a top leader for doing his job, resort to name calling and denigrating them as an “other” unworthy of such a position. We in the public have not pushed back enough maybe out of our own belief that we would never go down the route of totalitarianism or uprising. But now we are partway down that slope and facing people who are unapologetic in their rancor towards anyone who disagrees with them. This is where we have o stand up and say no more. Our indifference is on the verge of becoming willful ignorance and there is no going back from there. If you are a supporter of Trump, please reconsider. He has promised nothing except a vision with his own ego in charge and no other way but violent means to get there. If he is spurring violence towards reporters and people who have the constitutional right to speak up for matters thay believe in, he is not fit to be a leader and you need not follow him. The “throw the bums out” mentality has taken a dark turn and the actions of others has shown this. Making America great again only happens if we have great Americans upholding our values; right now Trump and his followers are displaying the worst of us. We need to be better than Mr. Trump (which isn’t hard) and we need to not fall for pie in the sky promises that have no hope of fruition and all the markings of ruining who we are as a nation. We know Trump will never apologize for his actions or who he is, but we can make sure that he never gets to office he seeks. We can also make sure that whenever the brand of Trump is uttered, it brings to mind fascism in bad hair. The best punnishment for Trump is not only losing the nomination, but to lose his businesses and fall into obscurity like some discarded misguided philosophy we never needed. It would be the best thing to happen to him and America. Thanksgiving is the holiday where we get together with family to share a meal and time among loved ones. We get to remember and celebrate the day the Pilgrims came to this land and shared a feast with the Wampanoag Indians, and ignore the death, dispacement and genocide the Europeans settlers laid out on the American Indian nations afterwards. It seems even more appropriate this year that we are reminded of how we are to treat the stranger with an international refugee crisis out of Syria. So appropriately we honor that Christian sentiment of helping the lesser in our society by throwing up even more roadblocks in an already long (2-3 year) wait to possibly get into this land of the free. What better way to get us into the spirit of community and helping each other than moving quickly towards a totolitarian state as promised by many of the popular hopeful GOP presidential candidates. I’m not sure exactly when the culture of denial and amnesia took over the holiday itself and threw a monkey wrench into this holiday, but it has. Like a drowsy tryptophan dream, seem to focus only on how good we are only to ignore how we normally treat our people and the others in the world daily on the other 364 days of the year. I would like to be more upbeat about this day, but with the reaction to all the horrific news this last week seeming more and more unAmerican, it’s very hard. I am glad to be with my daughter for Thanksgiving and spending time with her, but I worry about the society she grows up in more and more each day. I have hope she will be okay, but I wonder if the country I knew will be. 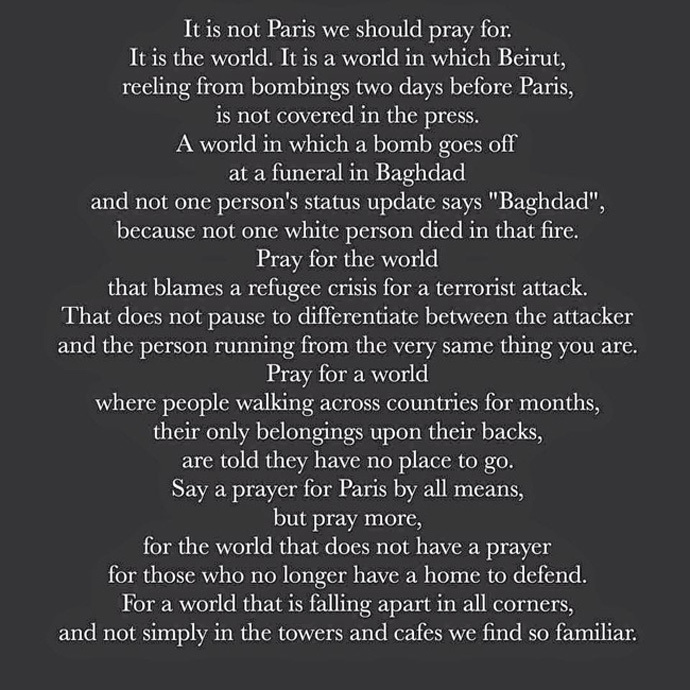 I think we are all reeling from the late night attacks on Paris that have only recently been claimed by ISIL. When these attacks happen, I’m not sure what people think. I know I feel numb at how senseless all this violence can be, the damage it causes and the recriminations and violence it can spur from then on. While I know this blog talks about spirituality and theology, at times like these it feels like prayers are not enough. Keeping Parisians in our hearts are good, but I feel like I want to donate blood and mail it overseas. The situation is compounded with the refugee crisis in Europe. We need to hold all of Europe in our hearts, and take a long range look to see how we may tackle the root causes of terror and war. I offer this poem by Karuna Ezara Parikh seen a lot in the past 12 hours.